Carnation (Dianthus caryophyllus) is an economically valuable cut flower in Japan. In late March 2016, leaf spots of carnation (cv. Konoha) were detected in a greenhouse in Chiba, Japan. Leaf spot symptoms appeared as brown or purple spots with concentric rings c. 5-10 mm in diameter on the upper leaves (Figs. 1-2). Disease incidence reached approximately 20% in the greenhouse (230 m2) in early May 2016. Three fungal isolates (CAR4, CAR6, and CAR8) were obtained from the leaf lesions. Conidiophores of the isolates grown on potato carrot agar medium were erect, pale to mid brown, with swellings at the distal ends, bearing a single conidium at the apex. Conidiophores of isolates CAR4 and CAR6 were 23-134 μm long and 3.5-5.5 μm wide, whereas those of isolate CAR8 were 35-221 μm long and 4.3-5.5 μm wide. 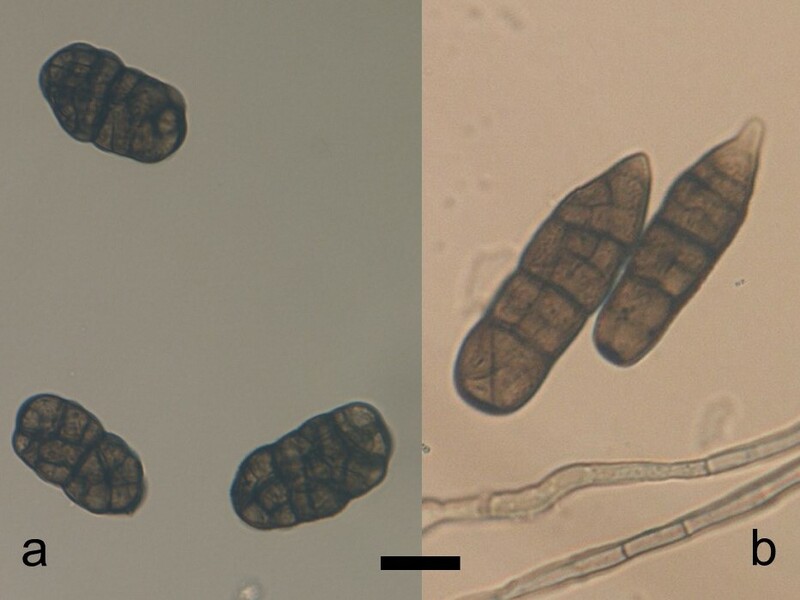 Conidia of isolates CAR4 and CAR6 were oblong to ellipsoid, with 3-6 transverse and 1-3 longitudinal septa, constricted at 1-2 transverse septum, pale to mid brown, verruculose, 20-38 × 12-21 (mean 28 × 17) μm, with a length to breadth (L/B) ratio of 1.1-2.3 (mean 1.7) (Fig. 3a). Conidia of isolate CAR8 were oblong, pointed at the apex, rounded at the base, with 4-9 transverse and 1-2 longitudinal septa, constricted at the 2-3 major transverse septa, pale to mid brown, verruculose, 35-72 × 14-22 (mean 49 × 18) μm, with a L/B ratio of 2.0-4.2 (mean 2.7) (Fig. 3b). The morphological characteristics of the two isolates CAR4 and CAR6, and isolate CAR8 were similar to those of Stemphylium herbarum and S. lycopersici, respectively, as described by Yamamoto (1960) and Simmons (1985). Molecular phylogenetic analysis was done as reported previously (Kurose et al., 2015), using four loci, the 5.8S gene of rDNA (rDNA-ITS), elongation factor 1α (EF-1α), glyceraldehyde-3-phosphate dehydrogenase (GPD), and the intergenic region between the vacuolar membrane ATPase catalytic subunit A gene and a gene involved in vacuolar biogenesis (vmaA-vpsA). Two isolates (CAR4 and CAR6) and isolate CAR8 (GenBank Accession Nos. LC413531-413542) were classified into Subgroup C1, including Pleospora herbarum (teleomorph of. herbarum) and Group A, including S. lycopersici, respectively (Fig. 4). 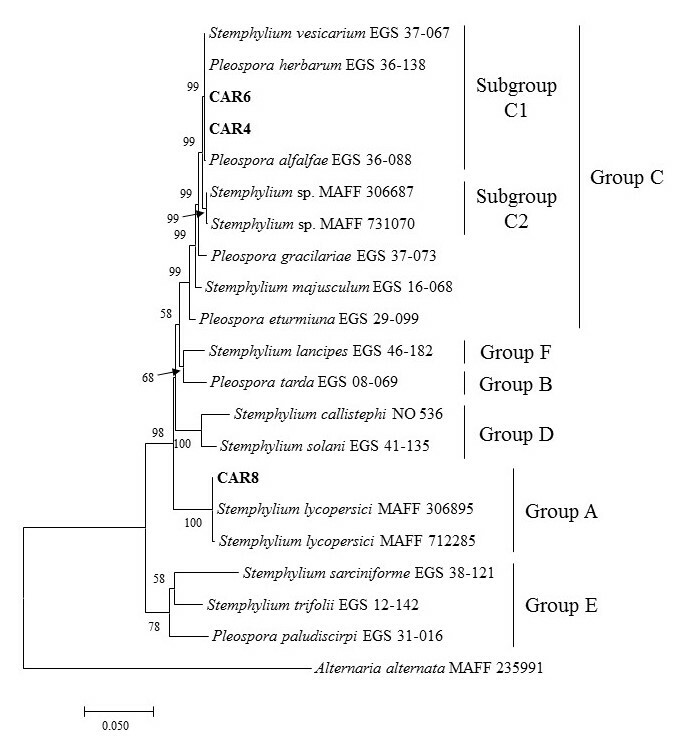 Based on both morphology and phylogeny, two isolates (CAR4 and CAR6) and isolate CAR8 were identified as S. herbarum and S. lycopersici, respectively. Pathogenicity tests were performed using carnation plants grown in 10.5 cm diameter pots for three months. Each inoculation test comprised two pots. Fifteen leaves of each plant were wounded with a needle. A conidial suspension (0.5-1.0 × 105 spores/ml) or sterilised distilled water as a control, was sprayed onto the plants. Inoculated plants were covered with plastic bags and then placed in a controlled chamber at 15°C with a 16 hr photoperiod. The bags were removed five days after inoculation (dai). The inoculated plants began to develop leaf spot symptoms 11 dai. The spots grew to 5-6 mm in size and developed a purple colouration 17 dai (Fig. 5). Two to seven leaves per plant showed these symptoms. The symptoms were similar to those of naturally diseased plants. Control plants remained healthy. The causal fungus was re-isolated from inoculated leaves, thus fulfilling Koch's postulates. This is the first report of S. herbarum and S. lycopersici causing purple leaf spot of carnation in Japan. The three isolates were deposited in the NIAS Genebank, National Institute of Agrobiological Sciences, Japan as MAFF 246765-246767. 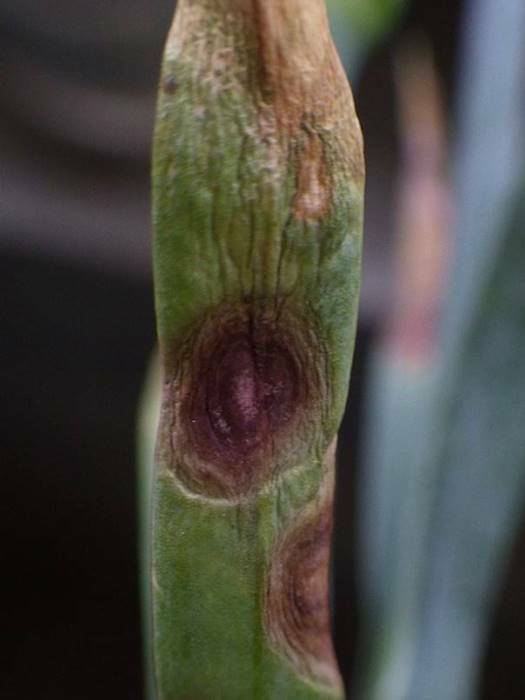 Figure 1: Symptoms of purple leaf spot of carnation caused by Stemphylium spp.in the greenhouse. 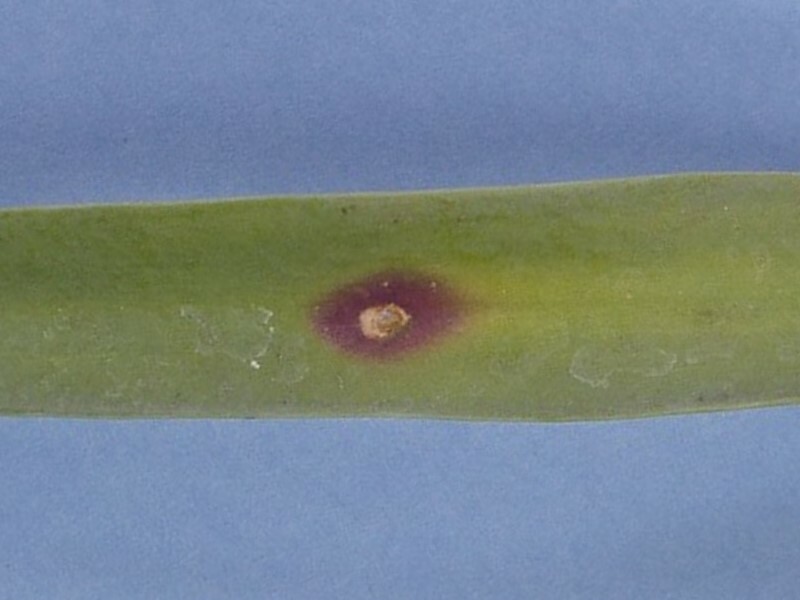 Figure 2: Diseased leaf showing purple spots with concentric rings. Figure 3: Conidia of Stemphylium herbarum isolate CAR4 (a) and S. lycopersici isolate CAR8 (b) on potato carrot agar medium. Bar = 20 μm. Figure 4: Maximum likelihood tree based on the ribosomal internal transcribed spacer regions including rDNA-ITS, EF-1α, GPD and vmaA-vpsA sequence data for 20 Pleospora/Stemphylium isolates. Numbers on the branches represent bootstrap values obtained from 1000 replicates. 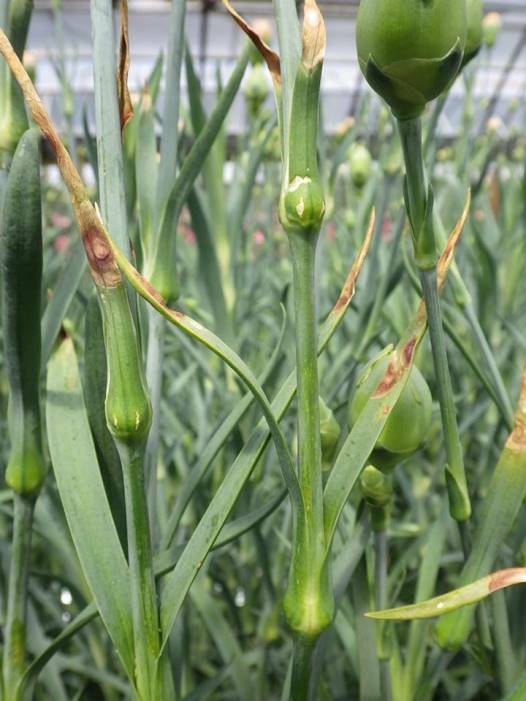 Figure 5: Purple leaf spot of carnation 17 days after inoculation with isolate CAR6. Simmons EG, 1985. Perfect states of Stemphylium. II. Sydowia 38, 284-293. Yamamoto W, 1960. Synonymous species of Alternaria and Stemphylium in Japan (in Japanese). Transactions of the Mycological Society of Japan 2, 88-93.